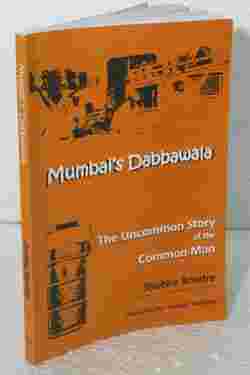 Mumbai’s Dabbawala—The uncommon story of the common man: OMO Books, 156 pages, ₹ 300. Over the last decade, the world woke up to the fact that Mumbai’s lunch-dabba system is an act of urban genius. The Guardian called it “perhaps the most ingenious" food delivery system in the world. The New York Times explored how it connected investment bankers in the business district with steaming hot Indian food from their mothers’ kitchens. Dozens of Indian publications applauded the dabbawallahs’ Six Sigma rating (for professional efficiency) from Forbes magazine, and the attention that Prince Charles gave them. There has even been time for a minor backlash; when the dabbawallahs made much of the wedding of Charles and Camilla Parker Bowles in 2005, R.K. Laxman drew a gently snobbish cartoon of the lunch delivery men racing about their business in three-piece suits. But the dabbawallahs were invited for the wedding in London, and two of them did attend. That last is probably why Shobha Bondre subtitled the new English translation of her Marathi book, Mumbaicha Annadata (Mumbai’s Dabbawala in English), “the uncommon story of the common man". Bondre got in touch with them during the barrage of media attention to develop a picture of how their intricate, near-fail-proof organization came into being. Kamyunista Jahirnama, the Marathi translation of The Communist Manifesto, translates the word “lumpenproletariat" to “Mavali". Originally a name for the people of the hilly Maval region of western Maharashtra, the word may be most familiar to non-Marathi speakers from Hindi films, where it is used interchangeably with goonda, or hooligan. In a recent paper in the Economic and Political Weekly, Juned Shaikh explains that “mavali" in the Bombay Presidency signified “categories of people prone to create law and order problems for the colonial police". Although rural Maharashtrians across regions and castes poured into Bombay through the late 19th and early 20th centuries to work in its factories and mills, the worker, or kaamgaar, still constitutes a category distinct from the underclass of infrequently employed mavalis—at least in translation. As it happens, the man who first began the city’s supremely orderly dabba services was a Maval native. Mahadu Bacche came to Mumbai in 1890, looking for work. His odd jobs included unloading cargo off ships and hauling goods for traders; the lunch-box delivery idea was a sudden brainwave. He began that year, transporting hot food from homes to government offices in the Fort district on foot. His Maval compatriots, joining him shortly afterwards, began to be called “bhonawalas"—the meal men—by Parsi housewives. Mumbai’s infrastructure had to work to keep pace with the dabbawallahs. They began, as much of the great mass of migrant labour in the 1890s and early 1900s, living in small rooms in central Mumbai, spending their days walking from kitchen to canteen as they connected middle-class south Mumbai with the imperial business district. The suburban railways, in their present form, developed much after their business began (watching the dabbawallahs congregate at Churchgate on a busy morning makes it harder to remember that it wasn’t even a terminus station until 1931, when the Colaba stop was shut down). When Dhondiba Medge, the last president of the dabbawallahs’ association—the Nutan Mumbai Tiffin Box Suppliers’ Association—began work as a young man in 1940, he started out on monthly wages of 8. Around 20 dabbawallahs would pool in to rent a shared room in Grant Road or Dadar. Women workers made gradual inroads into other areas of industry, and housing and lifestyle patterns changed as Mumbai went from being a hive of male labour to a place women and families could lay some claim to. But long after the mills had women running their looms and housewives overseeing canteens in chawls, the dabbawallahs remained a singularly male organization. The job was always about incredible physical stamina. Today, the dabbawallah might not walk from home to office, but carrying up to 75kg deadweight on a rush-hour morning train is arguably more challenging. As Mumbai stretched out along the suburban rail lines, and workers’ commute times increased, so did the scope of the dabbawallahs’ job. Carrying a dabba from Parel to Fort may be a matter of comfort, allowing fresh food to arrive hot on a lunch table. But carrying one over the considerably longer distance from Borivali to Colaba is more about distributing labour: At such a distance, workers may start out from home well before lunch is made, and the dabbawallah is a way to manage time for both the cook and the consumer. In a city that developed haphazardly as a gigantic workhouse, organizations like the dabbawallahs are symbolic of how links between people can make up for, and sometimes surpass, the deficiencies of infrastructure. Like the markets around railway stations which stay open long into the night so that returning commuters may shop for dinner, or small neighbourhood stores which will offer home delivery even for a single strip of paracetamol, the dabbawallahs are part of a vast unstructured labour force that exists primarily to make life in Mumbai easier: a service economy by any other name. Despite faltering in the 1980s, thanks to internal administrative issues and radical changes to Mumbai’s industries, the dabbawallah service survived, and by some reports continues to grow even today. Long after the end of the mills, the increasingly flexible work timings in white-collar businesses, and the rapid rise of restaurants around work areas, approximately 5,000 dabbawallahs still carry 20,000 lunches to work every day, for 400-450 a month. Their cooperative policies ensure that almost every dabbawallah earns 6,000-8,000 a month. In Mumbai’s Dabbawala, Raghunath Medge, the son of Dhondiba Medge and current president of the Nutan Mumbai Tiffin Box Suppliers’ Association, tells Bondre that the Gandhi cap covers the dabbawallahs’ “only computer—the head" (not wearing it makes a dabbawallah liable for a 25 fine; the organization enforces this and other social discipline rigorously). If it makes their work seem archaic, it also implies an unusually old network of trust. Today, young men from Maval still come to the city to stay with relatives, join the dabbawallah network and take over the running of the tiffins the way their compatriots have for generations. There’s no such thing as a free lunch, the Chicago economists say. The dabbawallahs are here to reassure Mumbai that there is at least such a thing as a hot one.